One has to give this to new Major League Baseball commissioner Rob Manfred: He knows how to rock the boat. With Manfred’s inaugural season at the helm of MLB set to officially begin in late March, the new commish has already made a name for himself by refusing to take any potential rule change completely off the table, so long as there is momentum from fans and the league in support of it. If you haven’t been playing close attention, this may have resulted in the perception that baseball is headed for a world of turmoil, marked by hard and fast dividing lines between hard-line baseball purists and the players who agree with them, and the rest of the fans and baseball advocates in the world that want to see baseball maintain or improve its place in the consciousness of the American general public. Of course, the potential pitfalls of a potential rulebook reform in any sport is significant; certainly deserving of more research and discussion than a one-off paragraph that probably comes across as very “us versus them” in nature. On these very pages in the past, I have warned of the inherent dangers (and banalities) of professional sports molding their rulebooks in order to try and mimic the market share that the NFL holds. But I will go even one step further in the interest of full disclosure: Baseball, in its current form, is my favorite sport. If no changes are made, I will still watch as many games as anyone in America this season, and enjoy every second of it. Any changes made to the sport of baseball are not being done with my interests in mind, which is exactly why I’m the perfect person to say that Rob Manfred is not going to ruin Major League Baseball. Manfred’s early tenure has been marked with small fires to put out here and there, most notably with his announcement that he would consider banning defensive shifts, then again on Monday when the new commissioner shocked baseball fans everywhere by refusing to take a shortened season off of the table for the future. The former proposal especially rattled some of the premier minds in baseball who almost universally agree that batted ball opportunities, rather than outcomes, have had a far more profound effect on the sport. But Manfred isn’t pushing these agendas actively; he wants to gauge the reaction of the general public. In reality, there’s not another major sport that has as big of a problem as MLB with enforcing rules that are already on the books. 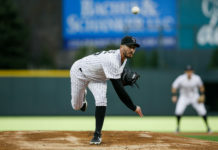 In fact, most of the major problems that are pointed out in the majors can be traced back to a rule that is not enforced the way it was intended. The measures put forth to improve the game this season certainly fall under this category. MLB has always moved very deliberately with rule changes. 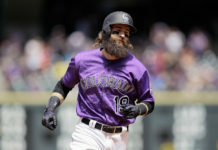 Last offseason, as the sport sought to cut down and eliminate home-plate collisions, it went back and started calling catchers for positioning themselves in the base path before having possession of the ball. Despite being met with charges of ruining the sport and “wussification” of the game, the rule had been in place for decades and home-plate collisions didn’t really have any meaningful history in the sport anyways. Pace-of-play adjustments (all of which are being encouraged for players to be mindful of, rather than punished for neglecting in all but the most egregious of circumstances) appear initially to be of the same design. That hasn’t stopped current players from complaining, which only furthers the perception that Manfred has run amuck before a pitch has even been thrown in the 2015 season. That’s certainly another worthy cause, to be sure, but with the average game now lasting a full half hour longer than it did 30 years ago, it’s tough to understand the vitriol by the same players who count on huge gates and billion dollar local television contracts to continue making exorbitant amounts of money in the nation’s only uncapped sport. 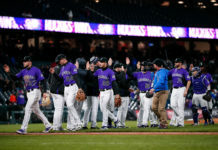 Complaints by Rockies players, such as Hawkins and Justin Morneau (who also expressed issues with the new rules), can probably be tied to key players on the team. Troy Tulowitzki is the slowest hitter in baseball according to Fangraphs.com, and reliever Rafael Betancourt is almost certainly on a Las Vegas list somewhere of pitchers most likely to be fined for working slowly. The better attitude towards Manfred and MLB pace of play rules can be found with Colorado’s breakout player of 2014, Corey Dickerson. Perhaps that attitude is why Dickerson continued to produce last season in a poor situation while so many other players dropped off for the Rockies, but his statement brings up perhaps the best point of all when it comes to rule changes in baseball. Virtually every innovation that has come to the majors in recent history was first introduced in the minor leagues. Any and all resistance to these measures will be temporary, and it won’t take long for detractors to just look like excuse-makers. 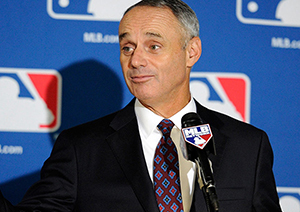 Rob Manfred may eventually turn the page from “open to reform” to “change for the sake of change,” but baseball fans who have already systematically lumped the new commissioner into that category are being naïve. The bottom line is that Manfred’s actions don’t represent anything that any responsible replacement for Selig wouldn’t be doing. If anything, despite the big talk, Manfred has been rather conservative with his proposed changes so far. Manfred is out to create a more attractive MLB product that appeals to the casual sports fan without selling out his sport for the sake of the lowest common denominator. While he may have his detractors in the early going, it’s hard to see how Manfred’s Major League Baseball isn’t a great step forward for baseball fans.